For over 100 years, St. Andrew’s United Church of Cairo has been a place where people living in the Cairo area from around the world have gathered together to worship God. 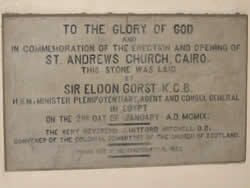 The inaugural services of St. Andrew’s Church in Cairo were held on February 5, 1899, in a classroom offered for this purpose on what is now known as Emad el Din Street. The dedication service in the present sanctuary of St. Andrew’s Church was held on January 3, 1909. Worship at St. Andrew’s continued during both World Wars, serving the English-speaking military personnel stationed in Cairo. St. Andrew’s ministry also includes assistance for refugees, which began with the arrival of refugees from the Horn of Africa in 1976. At that time, most of these refugees were studying in Cairo under the auspices of the UNHCR. They lacked a meeting place and faced many hours of boredom outside of school. On October 11, 1979, the Thursday evening “Refugee Center” was inaugurated in St. Andrew’s Guild Hall. In its early days, as many as 115 people came for games, conversation, and tea. In the early years there was also a rudimentary effort in English-language instruction. The refugee ministry has grown and changed through the years and today mainly serves refugees from Ethiopia, Iraq, Sudan, South Sudan, Somalia, Eritrea, and Syria. St. Andrew’s United Church of Cairo and St. Andrew’s Refugee Services have historically and are currently under the supervision of the Synod of the Nile & the Protestant Churches of Egypt.